Thankfully, this is not an origin story. I’ve never really been interested in how Penguin became who he is, and so I have no investment in reading that particular tale, especially given how many origins have been retold in the last two weeks and how many have been duds. 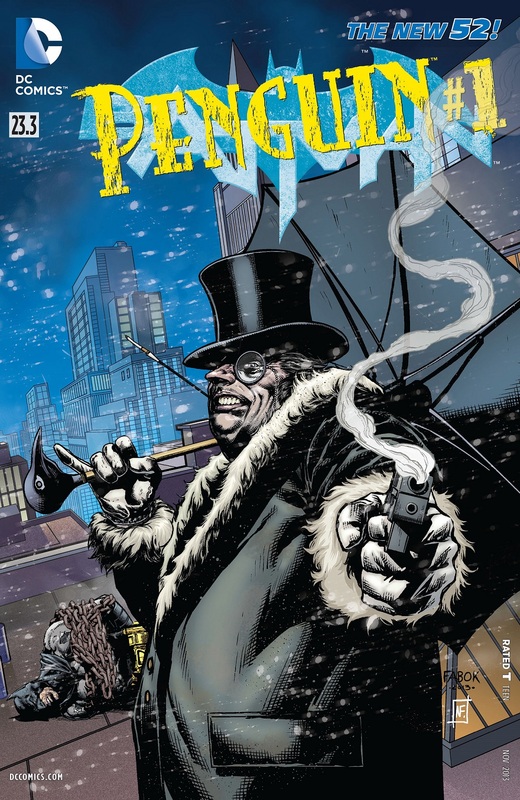 What Frank Tieri does is, he presents a story that is (apparently) set before the events of Forever Evil #1 and also calls back on the chaos of the whole Emperor Penguin arc, in which a new villain arrived on the Gotham crime scene and took over everything from the Penguin. The issue is about how the Penguin deals with people who… trouble him and question both his authority and his power, although I suppose for him authority and power are the same thing. There are two instances of this in the issue, one against some lowlife scum of Gotham who want to ride on the coattails of the whole Emperor Penguin incident, and the other against one of the more (apparently) powerful men in Gotham, with whom Penguin has a certain history. The way that Tieri writes this issue, Penguin is looking to rebuild his formerly unassailable reputation. At least, as unassailable as you can get without pretenders to the throne and undercover heroes. Tieri’s script is dark, moody and, ultimately, violent. He doesn’t shirk from showing the worst aspects of the Penguin’s personality. He embraces them and gives a really good outlook on the character, the kind that is possible without telling an origin story. And I preferred it that way. Another thing that works in Tieri’s favour here is that he gives us Penguin as he is: a bit of a crackpot, a villain who carries around an umbrella that doubles as a machine gun, triples as a sword and quadruples as a garrote, and someone who has a temper and the violent inclinations to match that reputation. These are the things that make his character great, and they are the things that make this issue great. We also have the wonderful artwork here by Christian Duce. As with Tieri, this is my first experience with Duce’s artwork, and I have to say that he does give a great outing here. Within the context of all the other Villain’s Month issues that have been released so far, Batman #23.3 doesn’t exactly stand out all that much, but on its own, its a great issue. Duce’s portrayal of Penguin and the other characters was fairly spot-on, the former especially. He gives the featured character a look that harkens back to his appearance in Batman: The Animated Series, a portrayal that I enjoyed thoroughly. Like with Tieri’s script, Duce’s art doesn’t shy away from showing off the depravities of the featured character. Quite unexpected. And with Andrew Dalhouse on the colours, its all pretty much a done deal, because Dalhouse has a great grip on capturing the right moods and tones of the scripts and the artwork that he has to work with. One of my favourite colourists currently in the industry. There’s only one negative to this issue: there is a distinct lack of clarity about where in the current timeline this issue is set. I mentioned before that this is seemingly set before the events of Forever Evil #1. It reads fully like a stand-alone story, except for the fact where it is mentioned that Batman is missing and that Gotham is tearing itself apart. We’ve seen heavy portrayals of that in other Villain’s Month issues, such as Mr. Freeze, Court of Owls, The Ventriloquist and others. So where exactly does this issue fit in? Things are so… normal here for the most part, and that makes one wonder. Regardless, this was still a greatly enjoyable issue and I wouldn’t mind seeing more of Tieri and Duce’s Penguin in any future issues. More Batman: #1-10, #11-12, Annual #1, #13-15, #16-18 , #19-21, Annual #2, #22-23, #23.1, A Death In The Family, Knightfall Vol.1. Posted on September 19, 2013, in 2013 Reading Challenge, 2013 Writing Challenge, Challenges, Comics Reviews, Review Central and tagged 2013 Reading Challenge, 2013 Writing Challenge, Andrew Dalhouse, Batman, Challenges, Christian Duce, Comic, Comics Reviews, Frank Tieri, Gotham, New 52, Penguin, Review, Review Central, Villain's Month. Bookmark the permalink. 10 Comments.